There’s nothing quite like sliding into a spa in the middle of the winter when it’s freezing cold outside. You can combat the winter blues and make it feel like it’s the middle of summer by getting into your spa during the colder months. However, before you do, there are some tips that you should follow. Check them out below. Put on a hat to prevent heat from escaping through your head. The idea of putting a hat on before jumping into a spa might seem a little silly to you. After all, won’t the spa provide you with more than enough heat? It will, but a lot of that heat will be transferred up and out of your head if you don’t have a hat on. Additionally, if your hair gets wet in the spa, it will make your head feel very cold. You can prevent them things from happening by putting a hat on your head during your time in the spa. Apply lotion to your face to fend off the cold, dry air. While your body will be warm and comfortable in the spa, the skin on your face will likely be painfully dry if you don’t have any lotion on. The winter air can really do a number on it and almost make you wish that you hadn’t bothered getting into the spa. You can stop this from happening by applying lotion and lip balm before you go outside and get into the spa. Keep a close eye on your chemical levels. In the wintertime, there are some people who will get lazy when it comes to monitoring their chemical levels. This can potentially cause damage to your spa, and it can also make the water in it unsafe. So if you’re planning on spending a lot of time in your spa this winter, make sure you’re constantly keeping an eye on your chemicals and adding more as necessary. 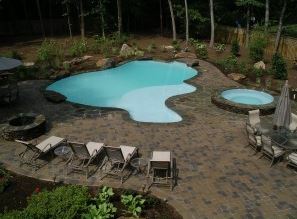 VistaPro Landscape & Design specializes in installing backyard spas. If you don’t have one and have been thinking about putting one in, call us at 301-805-0119 today to schedule a free consultation.